(Money Magazine) — Just a few years ago you could count on getting the bulk of your money back for almost any home-improvement project you took on. Today merely replacing a toilet seat can feel like throwing caution, and cash, to the wind. According to a study from Remodeling magazine, the average return on value for an upgrade declined from 87% in 2005 to 64% in 2009. But these six new rules will help you maximize your return on your remodeling investment. The smartest money now goes into “undeferring” needed maintenance. That’s because while buyers might appreciate enhancements like Jacuzzis and Sub-Zeros, they won’t tolerate a house with a leaky roof or antiquated plumbing. “If a property is known to have issues, today’s buyers won’t even look at it,” says Austin real estate appraiser Jim Amorin. And trying to keep problems a secret can cost you big-time. If buyers discover them during inspection, it’s now common practice to ask sellers not only to pick up the tab for the repair but also to pay a penalty to compensate the buyer for the inconvenience of having work done. So the $20,000 you saved by putting off a roof repair, say, could turn into a $30,000 credit to the buyers at closing, says Amorin. McMansions have gone the way of the SUV — and large additions don’t pay off either. “There’s been a fundamental shift toward quality over quantity,” says Warwick, R.I., real estate agent Ron Phipps. Having a big, formal living room plus an everyday family room is less desirable than having one multi-use common space. So rather than adding on, you’re better off repurposing existing square footage by reconfiguring the floor plan or capturing unused basement or attic space. Want an eat-in kitchen? Knock down the wall between the kitchen and dining room ($2,000 to $8,000, depending on whether it’s load-bearing or contains plumbing). That will instantly create a large eat-in kitchen and give the whole house a more open feel — without a huge investment to make up at resale. Some green improvements pay you back long before you sell your house. Install energy-efficient features, such as EnergyStar appliances and extra wall insulation, and you’ll see lower energy bills every month. Add in the federal tax credit of up to $1,500 that lasts through 2010, plus many local rebates and tax incentives (see dsireusa.org), and the work may pay for itself in just five years. Green features are also increasingly a selling point, says Phipps. “Most people in the market right now are first-time homebuyers in their thirties, and they’ve been raised to care about carbon footprints and being ecofriendly,” he says. The best way to go green is with a while-you’re-at-it job: When it’s time to replace your furnace, for example, upgrading to super-efficiency might add only $500 (after tax credits), compared with standard new equipment, but it will save you — and your buyers someday — $150 or more in annual heating costs. Home electronics seem like a deal, since prices have fallen about 50% over the past three years and continue to drop, according to Stephen Baker, president of industry analysis at NPD Group, a market research firm. Still, that doesn’t change the fundamental problem with expensive built-in technology: Put in a $10,000-plus dedicated home theater today, and something better will come along tomorrow and make your system look as if it’s from the Mesozoic Era. With buyers seeking any excuse to low-ball their offers, they’re not going to reward you for an out-of-date system. Tech infrastructure is different, however. Anytime you’re opening up walls for a construction project, have cabling and Ethernet ports installed. At about $80 a room, it’s a low-cost way to provide the capability for whatever technologies come along. During the boom, you could be the first on your block to have a luxury kitchen, spa bathroom, or in-ground pool and count on others following suit. And even if the neighbors never took your lead, there was plenty of equity growth to cover your costs. Nowadays that fudge factor is gone. “You really have to keep your house’s amenities in line with the neighborhood now,” says Kermit Baker, director of the remodeling futures program at Harvard University’s Joint Center for Housing Studies. If other houses on the block have real marble countertops, by all means add one to your house, but if everyone still has faux blue-marble Formica from the ’70s, you’re not getting your money back. Also, keep your projects design-neutral so they’ll appeal to the greatest number of people. Choose neutral colors and traditional electrical and plumbing fixtures unless your house has a modern architectural style. As with any volatile investment, the longer your time frame, the lower the risk. Don’t take on a big project if you’re likely to move in less than three to five years. There’s just too much chance that any money you put in — aside from necessary repairs or superficial cosmetic work — could be lost while the housing market continues to meander. But if you plan to stay awhile, don’t delay starting a project. Home improvements are a bargain right now, with contractors bidding 10%, 20%, even 40% lower for the same work than just a year or two ago, says Bernie Markstein, senior economist for the National Association of Home Builders. Grab them while they’re hungry for work and make it clear that you’ll be getting multiple bids so they’ll be motivated to undercut one another’s prices. You’ll fulfill the first rule of investing: Buy low. Then hope that when you’re ready to move, you can sell high. Be the first to know about NEW LISTINGS in Santa Barbara. Setup an email alert today. Do you have specific questions about buying or selling real estate in the Santa Barbara area? 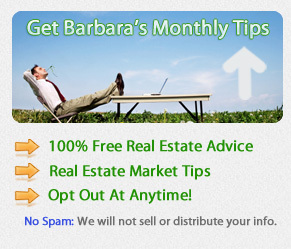 Ask to be setup on Barbara’s email-based home search to get instant alerts on price reductions and new homes for sale in the Santa Barbara, CA area. Contact Barbara Reaume by email ([email protected]), phone (805-453-9674) to find out the value of your home, discuss your options.